Shelcano is a Water/Fire Pokémon. 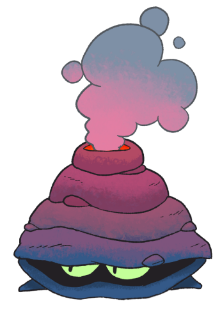 It evolves into Mollotov with a Fire Stone. Shelcano can only be found in the wild with the use of Dive, as it sits on the bottom of the ocean floor. Shelcano is reclusive and dislikes being disturbed. It sits on the ocean floor and shoots a geyser of superheated bubbles at those who pass above it. Within its shell, it produces a magma-like material. The glow from its eruptions can sometimes be seen from boats at night. Shelcano is a bivalve mollusc that resembles a volcano. It is also based on deep-sea hydrothermal vents. Shelcano can learn Withdraw, Shell Smash, Protect, Bubble Beam, Sputter, Scald, Eruption, and Lava Plume.